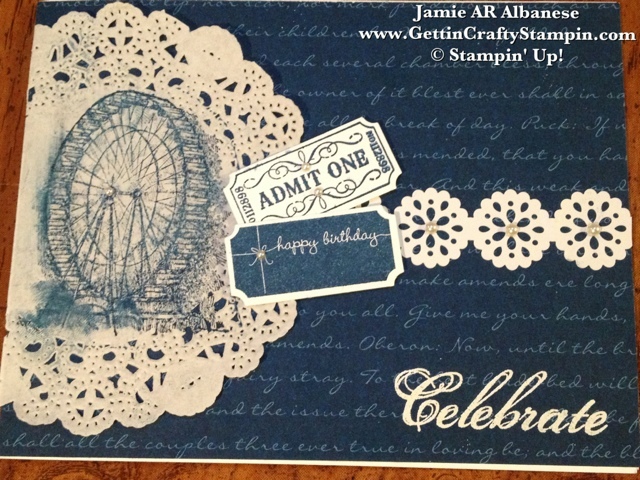 Getting Crafty with Jamie: Celebrate, That's the Ticket! Spring Mini and the Sale~A~Bration mini!! non-pink lady in your life (like me - lol)! When I think of Ferris Wheels, Fun Cotton Candy Filled Days... I always think of the amount of Tickets I'd need to ride the rides! 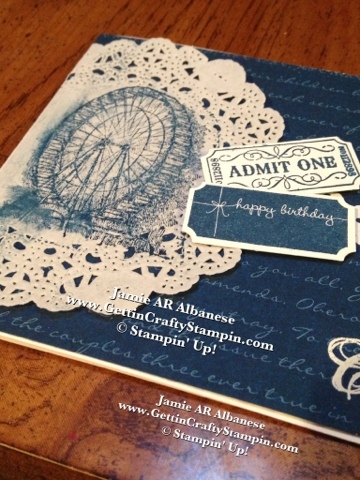 This card is inspired by my childhood memories of hoarding tickets for my favorite rides! ALWAYS a favorite of mine as it took me to the clouds! Basic Jewels Pearls collection... this card comes to life! 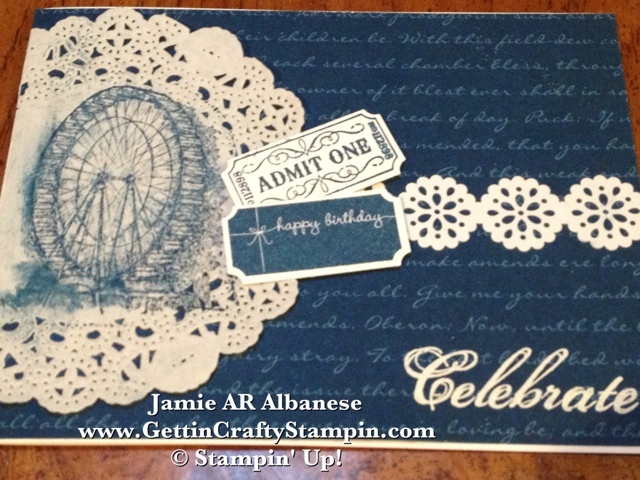 Stamping the Ferris Wheel on the Doily ties the circle feel of the wheel, the Tea Lace Doily, and the Delicate Details Lace Tape continue the feel in subtle ways. Before adding the Pearls it's a sweet card... the Tickets from That's the Ticket (Spring Mini stamp set) coordinate with our Ticket Duo Punch and make it easy and fun to ticket someone! Admit one - it's a Happy Birthday! in-line with the vintage, femininity of the lace. What are YOUR Memories of Festivals and Park Rides? I hope that this encourages YOU to Celebrate! Have YOU seen our Stunning Spring and Sale~A~Bration Minis?!?! Look HERE for ALL of our Catalogs! the Spring Mini and Sale~A~Bration are offered for a LIMITED Time!! ALL of the FREE items are YOURS and UNLIMITED... so don't miss out.. Get them NOW! This is a fantastic card. Love all the details! 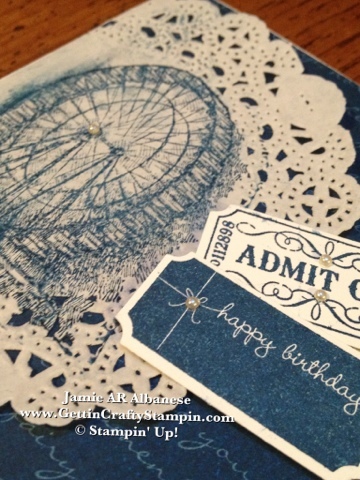 Pretty card, I like how you used so many different elements on it. I love the look of the ferris wheel stamped on the doily. 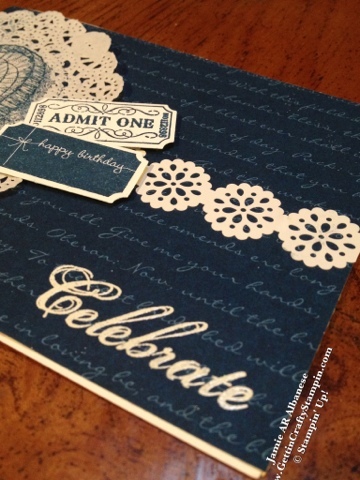 The tickets and pearls are adorable embellishments. So many great details on this card, I love them all! What a fun card, I just got that ticket set with the punch, can't wait to use it. Great job on the challenge this week.